Governor Phil Scott has stated he wants economic growth to be a cornerstone of his administration and this week in Rutland he got a preview of what that growth could look like in a state with a rich history of agriculture. On a tour of the Vermont Farmers Food Center (VFFC), Scott joined elected representatives and members from the VFFC board on a tour of the grounds, led by VFFC founder Greg Cox. The market has seen some serious growth of its own. In 2007, when the market launched, it grossed $700,000 in sales. Cox said in 2015, the nonprofit passed $2 million in sales. While the center hosts full winter and summer markets with fresh produce, a range of freshly cooked cuisines and other goods, the center is now looking to increase storage and food processing infrastructure available to small food producers. As a farmer with 40 years of experience, Cox said newer farmers struggle with scaling their operations up to stay competitive in a larger market. “They don’t have infrastructure,” he said. Inside the Farmer’s Hall, which hosts the winter farmer’s market, the center operates a commercial kitchen available to bakers and chefs at $10 per hour. Cox said the kitchen would serve as a “stop-gap measure” until larger facilities on the property could be completed. A neighboring barn next to the Farmer’s Hall will host the commercial kitchen and the culinary institute with 12,000 square feet of space on three floors that will include meat cutting rooms, dry and wet kitchens, and rentable storage space while the culinary institute will provide training to those interested in food-related businesses. A 4,700-square-foot post and beam structure will have shared-use, climate-controlled food storage that can be rented out to farmers by the cubic foot. In times of emergency, the facility could also hold food for distribution. Plans for greenhouses behind the Farmer’s Hall are underway and will be used to teach courses through Green Mountain College and other groups. All of these buildings date to Rutland’s industrial past, when sugaring equipment, sewer grates and more were manufactured in these buildings. Cox told the governor all the buildings are structurally sound and are now going to see a new phase of life. Scott said he was impressed by the work of the organization and its founder. 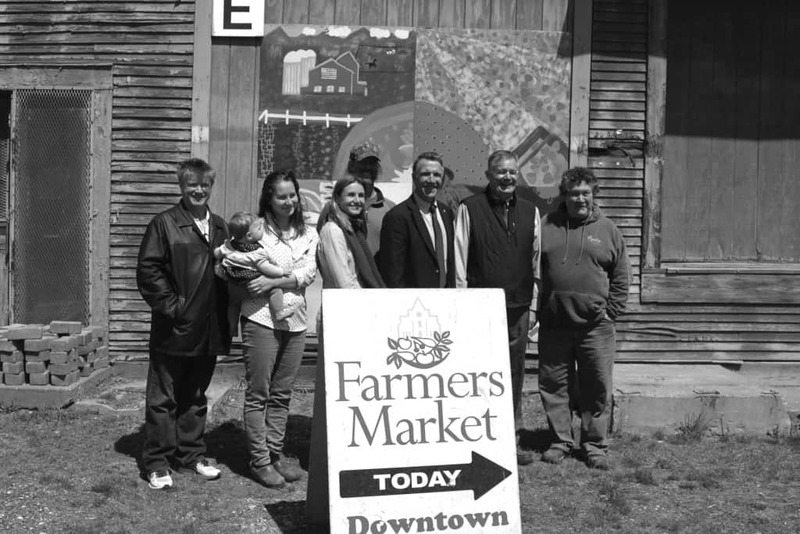 Governor Phil Scott poses with members of the Vermont Farmers Food Center board on a recent site visit.